Success! Watch your email to confirm your subscription to The Prosperity Report and download your FREE Prosperity Pillars poster. 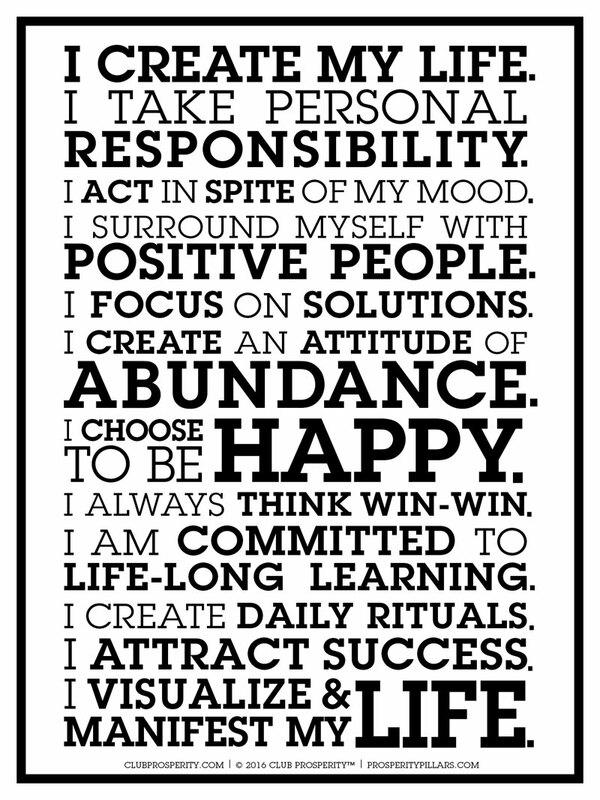 Pillar number 2 of the Prosperity Pillars is the principle that I Take Personal Responsibility. Now that this is a really big one and it's difficult for a lot of people. POWER YOUR BUSINESS AND PERSONAL LIFE, BY ACCESSING DAILY STRATEGIES, TRAINING, MINDSET AND BUSINESS RESOURCES. You’re an aggressive, talented and busy entrepreneur. You live in a fast-paced world of decision making and deal making. Use the extensive resources in the Club Prosperity Mobile App to power your mind and create daily rituals that will empower you to make the right decisions and take your success to the next level. THE ACADEMY IS AN EXCLUSIVE, MEMBERS-ONLY NETWORK FOR ENTREPRENEURS THAT ARE CHANGING THE WORLD. THE ACADEMY is the fastest growing, private community of passionate entrepreneurs looking to unleash their potential. THE ACADEMY provides the resources, training, and tools to help passionate, motivated individuals from around the world Unleash their Potential. As a member of THE ACADEMY you have exclusive access to: training, strategy, networking, and mentors that will help you, the entrepreneur, cut the leash that’s holding you back in business and life! Enroll in THE ACADEMY today and take your business and personal life to the Next Level. The richest people in the world use coaches and it’s no accident. What all high achievers know is that they need someone who can give them an objective view on the results they are working to create in their lives. G3 WORLDWIDE IS THE WORLDWIDE LEADER IN SALES AND MARKETING IN THE DIRECT MARKETING, SEMINAR AND DIRECT RESPONSE ARENA, AND HAS GENERATED HUNDREDS OF MILLIONS OF DOLLARS IN REVENUE FOR ITS CLIENTS. G3 Worldwide has paid out more than $1 Billion to its partners over the last 10 years. G3 Worldwide has successfully promoted, marketed staged seminars and provided fulfillment for some of the biggest names in the industry, including Donald Trump, T. Harv Eker, Peak Potentials David Bach, Brian Tracy, Steve Young, the Duchess of York, and many others. G3 Worldwide’s clients include: New Peaks, Success Resources, Reason or Results, XPert Sytems, Global-Based Technologies, Monavie, Moneywise, MPI, R1 Real Eastate, ListPipe, Excel Equity and many others.